There are currently 91,707 users on this website. 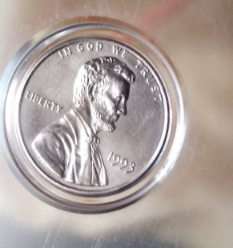 US One Cent Steel Penny Question? I got this penny that looks like it is just zinc(or something else). Need ya help. Someone wants to buy it. Don't we any rip ( or get ripped). Any suggestions? Your replies were split into their own topic and moved to the appropriate forum for the proper attention. How much does it weigh (coin only, obviously) and can you post a pic of the reverse? Is it magnetic? I agree with Spruett. Weight and magnet are a good place to start. I hesitate to say it's plated. Most plated coins I come across have details muted somewhat. That LMC has crisp sharp details. Note that if you don't want to remove the coin from its holder weigh with it then weigh an empty holder. Simple math gives us an answer. 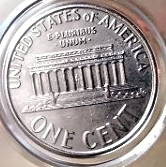 The coin does not look plated . Looks interesting like it escaped the copper plating . If you can give us the weight that would be very helpful. (Of course without the case). It may have gotten out of the mint without Being plated. It's also in pretty nice shape. Fingers crossed!